What is a Phyto and Fumigation Certificate? Do you know that how can you get Phyto and Fumigation certificate in Pakistan? If not! Then you are in a right place here we already discussed the complete list of Required Documents For Export Customs Clearance in our last article and today we are going to clear up the complete procedure to obtain a Phytosanitary Certificate and Fumigation Certificate, here we will also discuss the required documents for Phyto and Fumigation. Let`s start! What is a Phytosanitary Certificate? A Phytosanitary Certificate is an official document issued by the plant protection organization of the exporting country to the plant protection organization of the importing country. In Phyto Certificate plant protection department certifies that plant product (Export Cargo) have been free from quarantine pests and other injurious parasites. Phytosanitary Certificate also called a Pest Control Certificate, Sanitary Certificate and Health Certificate for export. Fumigation company will issue a Fumigation Certificate after Fumigating Export Cargo. This certificate confirms that the fumigation job has been carried out according to specifications duly advised by the Entomologist. Note:Only licensed fumigation company in Pakistan can issue a Fumigation Certificate. Why We Need Phyto Certificate ? If we export plant related products (i.e. wheat straw, wood articles, herbs and spices, dried and processed fruit, vegetable products, etc..) so it is mandatory for us to avail services of fumigation as precautionary measures to avoid or eradicate the pests and insects from the export cargo therefore we need to get Phytosanitary Certificate and its also necessary for us to attached phyto certificate in the weboc system, without it customs examinations officer will not clear our cargo. After discussion the importance of Phyto certificate in export, now we are going to define a complete procedure to obtain Phyto certificate here we will also see what documents required to get phytosanitary certificate. Here fumigator refer`s to a pest control company, before appointing any fumigator make sure they are genuine fumigators. (i) How to check a genuineness of fumigator ? If the firm/company is genuine then they must have the license duly issued by the Department of Plant Protection, Quarantine Division, Government of Pakistan so ask them to show it. For avoiding the risk of the lives of human beings and your important assets so you must appointed guaranteed companies of professionals. Once our consignment ready and clear from inspection team then we will call our appointed fumigator to fumigate the export cargo. After calling him, fumigator will visit our premises to perform fumigation process and start spraying in order to free our shipment from quarantine pests and other injurious parasites. 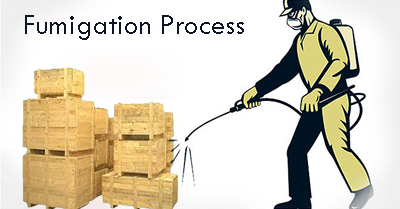 After completion of fumigation process, fumigator place a stamp on the cargo and this stamp confirm that the fumigation job has been done and your cargo safe for export. Now we need to provide some documents which help our fumigator to get a phyto certificate from Department of Plant Protection. As we provide an invoice to our fumigation company, they will start their process to get Phyto from the Department of Plant Protection, once they receive a Phytosanitary Certificate from them (Department of Plant Protection) copy will email you and the original can be picked from fumigators office. 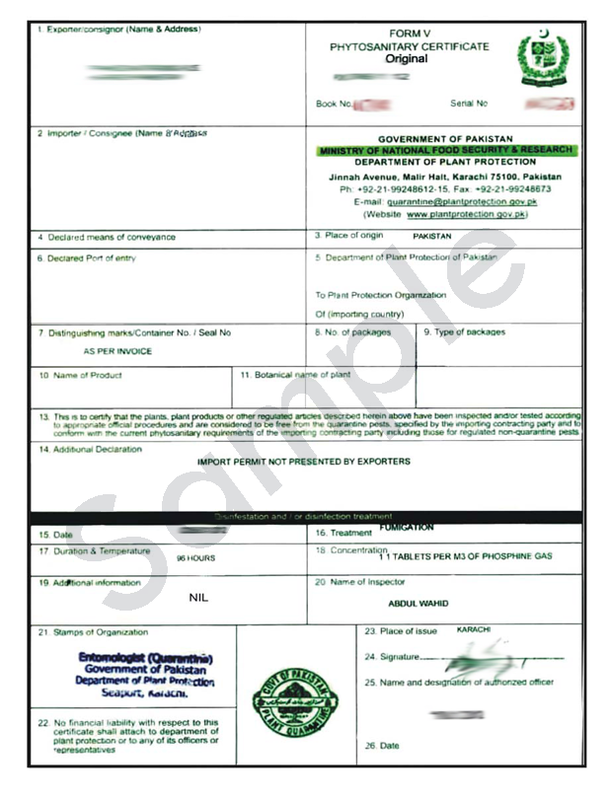 See Phytosanitary Certificate`s Sample Below. * How To Get DTRE Approval. * How to Get Certificate of Origin. * Documents Required for Import In Pakistan. * Documents Required For Customs Clearance. * Documents are Required For Export In Pakistan.